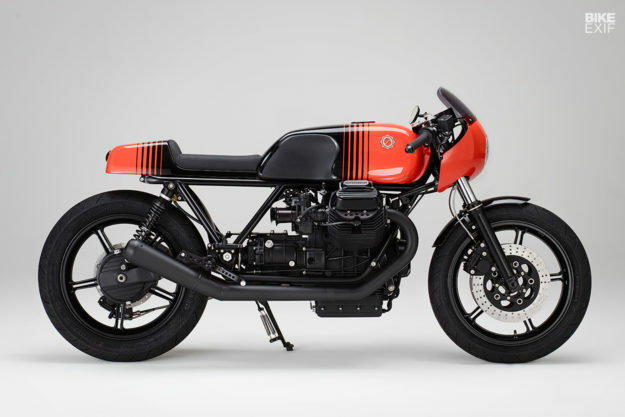 If there was ever a blueprint for the ultimate Moto Guzzi cafe racer, this is it. 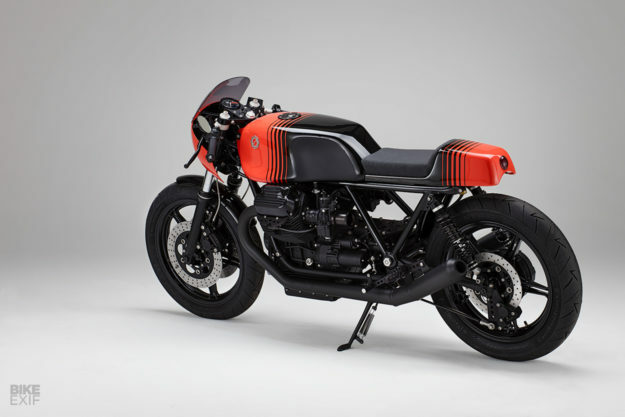 Kaffeemaschine’s latest build has the perfect stance, the perfect tank, and that iconic engine—blacked out, which of course draws even more attention to it. Builder Axel Budde has been tantalizing us with his Le Mans-based customs for seven years now, and we never tire of them. There always seems to be a little bit extra or a little bit different in each build, but this machine, KM22, tops the lot. KM22 is, to put it bluntly, a mongrel. But instead of being a mish-mash of parts, it’s a remarkably coherent whole. The starting point was the frame, which Axel describes as a “cleaned and modified” 850T unit from 1974. 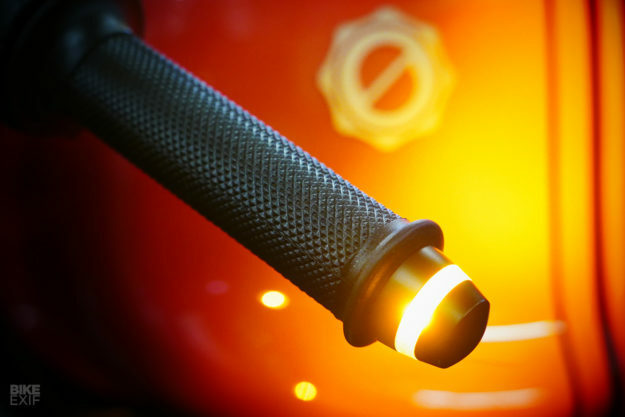 But those mods are not your usual detabbing and grinder work: he’s worked the engine breather into the frame tubes with a labyrinthine system of welds, to cope with the high revs of the hot-rodded V-twin. 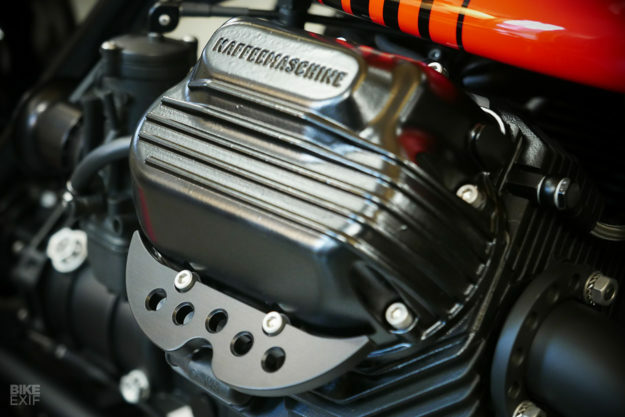 This replaces the usual Moto Guzzi breather box that sits between the cylinders, separating the oil from the air. The engine, transmission and rear drive are from a Le Mans Mk IV. Axel has gas-flowed the heads, upgraded the capacity with 1100 cc cylinders and pistons, and raised the compression ratio with twin spark heads. He’s also fitted Carillo rods, a race cam and lighter valves, and had the crank balanced dynamically. The carburetors are 40mm Dell’Ortos, jetted with the help of a Lambda instrument. It’s an engine with serious punch, driving through a lightened and balanced clutch/flywheel setup. 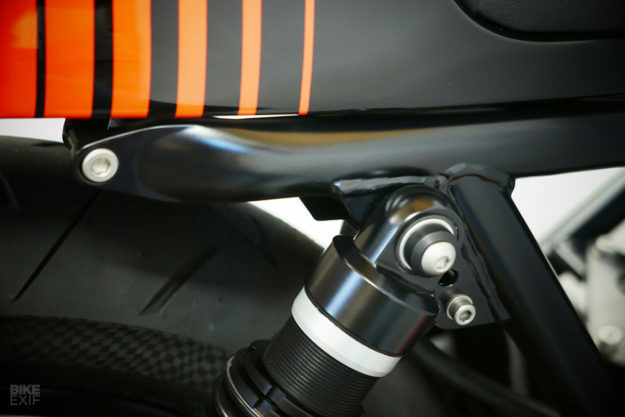 This sort of performance requires tight suspension, so Axel has installed fully adjustable forks from a Yamaha R6. “It was a crazy effort to adapt this fork,” he admits. 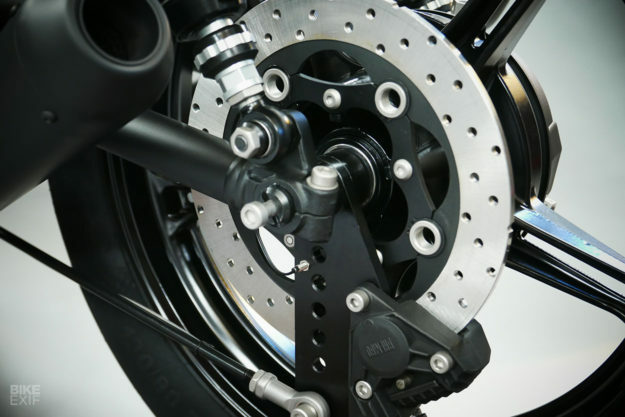 He’s used modified BMW triple trees, and a custom steering head and front axle—as well as shortening the tubes and finding a way to make the classic Brembo calipers fit. The back end was simpler: here we have Wilbers shocks, which Axel took apart so he could change the finishing. So Axel milled down the rims to reduce their profiles, and modified the floating discs. (“They were pretty ugly originally.”) They now look much lighter, and accommodate a smaller rear brake caliper. The bodywork looks old school, but it’s actually carbon fiber. 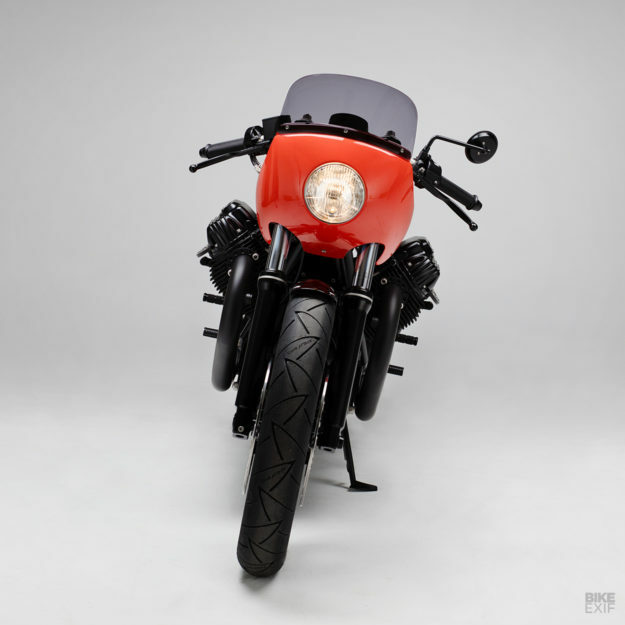 Axel shaped a new seat, and tail unit, which butts up perfectly to the Magni-style tank and hosts an LED rear light. Leading the way is a Le Mans 1 style fairing, but with a smaller headlight than usual. The stainless exhaust is a Kaffeemaschine part, and most of the regular Moto Guzzi alloy hardware has been galvanized black. Even the tiniest stainless steel parts have been glazed or chromed black and Axel has cleaned up all the screws and fasteners on his lathe. It’s a truly obsessive attention to detail. 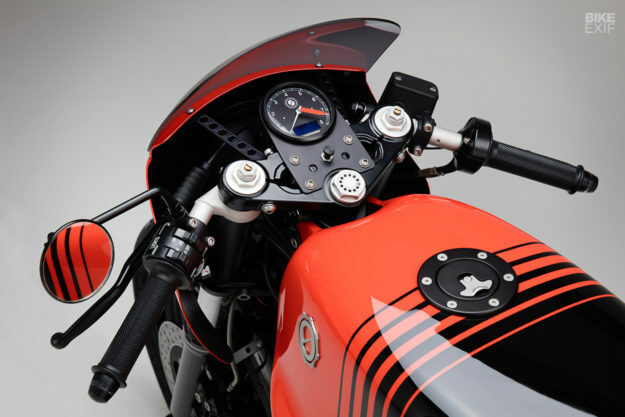 Hidden from sight is a new and very minimal wiring loom, using a modern generator and lithium-ion battery, an electronic ignition, Kellermann indicators and a Motogadget instrument with a customized dial. What is very visible is the stunning paint. Porsche fans will recognize it as Lava Orange, a delectable shade most commonly found on GT3 RS models and as an option on recent Boxsters. 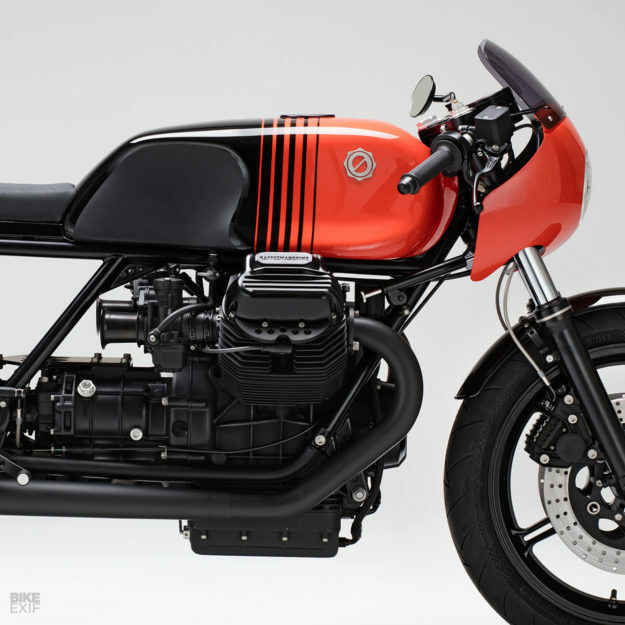 It’s not your typical low-key custom Guzzi shade, but it’s sharp and effective. KM22 tips the weighbridge at just 177 kilos (390 pounds), and has recorded a very solid 97 horsepower on the dyno. Which makes it a lot of fun on both the road and track. In his previous life Axel was a stunt driver, and these days, he still gets his kicks from doing laps. 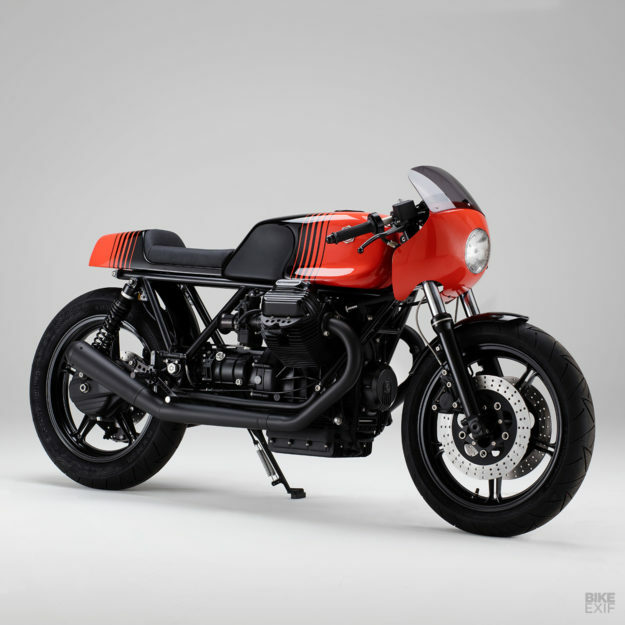 It sounds like the perfect Guzzi to us, and a blueprint for building a high-performance custom. There’s only one downside, though: Axel’s keeping this one for himself, so it’s not for sale.